Quentin Super’s new book “The Long Road North” is the poignant story of a young man’s physical and spiritual journey to find himself. 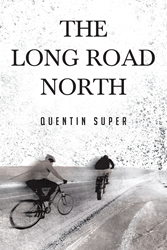 Recent release “The Long Road North” from Page Publishing author Quentin Super is the emotional journey of one young man’s mission for self-discovery and adventure. When two best friends embark on an eight-hundred-mile journey on their bicycles, they discover not only their physical limitations, but also assess who they are and where they are going. Quentin Super, an avid long-distance bicycle rider, and graduate of St. Cloud State University has completed his book “The Long Road North”: a moving and reflective tale of self-discovery and resilience. Published by New York City-based Page Publishing, Quentin Super’s moving tale of his eight-hundred-mile journey north during his spring break, with his best friend, serves not only as an adventure but also as a philosophical quest for inner light and guidance. When Super experiences a period of debauchery, promiscuity and emptiness, it prompts him to embark on a life-changing journey. Readers who wish to experience this inspiring work can purchase“The Long Road North” at bookstores everywhere, or online at the Apple iTunes store, Amazon, Kobo, Google Play or Barnes and Noble.